The N10-005 Real Practice-Lab gives you access to a real networking environment including Routers, Switches and Microsoft Windows devices that enable you to gain hands on skills in networking concepts and technologies. By completing the lab tasks you will improve your practical skills in installing, configuring, monitoring, and troubleshooting a variety of networking technologies including Microsoft DHCP services, installing Cisco routers and switches, monitoring a network using packet sniffers, configuring layer 2 and layer 3 services, understanding high availability and controlling remote access and security. Becoming proficient in these tasks will also help you understand the objectives and competencies required by the CompTIA Network + certification exam. Using the Real Practice-Lab to its full potential will help you develop your skills in becoming a engineer or help you develop your current skill level in networking technologies. Once you have used the lab for either 25 / 50 or 100 hours we will acknowledge this achievement by issuing you a certificate. This can be validated by potential employers or managers alike, proving your abilities in networking. Hardware installation: Learn how to install hardware and software components of Cisco Routers and Switches and Microsoft DHCP services to create a real world network. 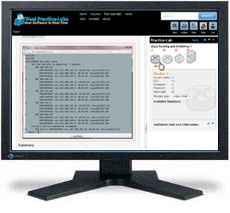 Using the lab will enable you to use commands and see their output in real time on real equipment hosted online. IP Addressing and Routing: Learn how to configure IP Addresses on devices understanding subnet masks and network addresses; configure static and dynamic routing to enable the network to dynamically understand the topology of the environment. Layer 2 technologies: Understand how to use layer 2 technologies to sub-divide networks and create a loop free topology throughout the lab environment. Use advanced link configuration techniques to enable these networks to communicate with each other. Security: Learn the fundamental topics of how to use applications to remotely control appliances and how to secure access to these devices. Monitoring and Optimisation: Understand how to identify problems, use various tools and applications and logs to monitor and troubleshoot the network and improve availability.